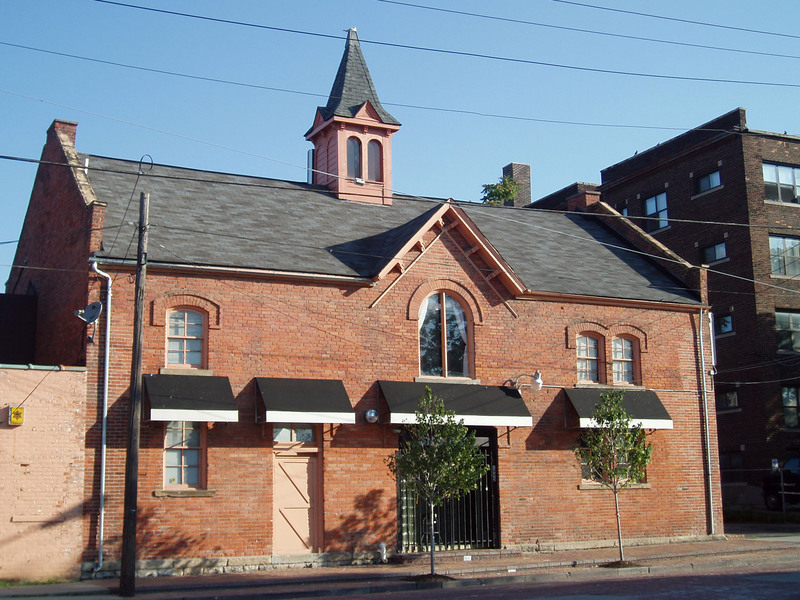 The website of the Detroit Historic District Commission states that four carriage houses remain on the city’s east riverfront. Eric Hill and John Gallagher, in AIA Detroit, (Detroit: Wayne State University Press, 2003) report that a handful of carriage houses remain in this area. I do not know of any other carriage houses on the city’s east side. The one you see above merits historical designation since it clearly represents a type of substantial residential construction that was no longer required once Detroit’s factories produced motor vehicles. Toward the end of the Nineteenth Century, when extremely prosperous families built mansions in cities, they frequently erected a large carriage facility to the rear of the property, accessible through an alley or street that parallel the street the home faced. These large structures provided space for the household’s carriage and horses and may have provided living space for their chauffer and the liverymen who tended the animals. The first St. Aubin in Detroit was a military man assigned to Fort Pontchatrain in 1709. The intendant of New France granted a ribbon farm to Jean Cass St. Aubin in 1734. A street through or at the edge of this farm was named for François St. Aubin in 1747. Apparently the land remained in the St. Aubin family until about 1855. At this time, Francis Palms was promoting the development of East Jefferson as a residential area for the growing city of Detroit. In 1866, Jefferson Avenue Methodist Episcopal Church was built on land near the intersection of East Jefferson and St. Aubin facing East Jefferson. In 1885, James McGregor purchased the land, had the church razed and then built a mansion facing East Jefferson. Behind his home, Mr. McGregor built the carriage home that you see. The McGregor mansion was torn down in 1936 so that commercial building could be built along East Jefferson but the carriage house facing Woodbridge remained. James McGregor was born in Scotland in 1830 and then migrated to Canada in 1855. In 1860, he came to Detroit and entered the railroad industry. He became a superintendent of the Car Department for the Detroit and Milwaukee Railroad—a predecessor of the Grand Trunk Western firm that was eventually taken over their current owner, Canadien National. Later he went into business with Colonel Hecker and Charles Lang Freer in their Michigan Car Works that evolved into the Peninsula Car Company and, by the 1880s or so, became the nation’s largest manufacturer of railroad cars. His success provided him with the resources to build his home on East Jefferson and the carriage house that you see. At just about the same time, he built a summer residence for his family on St. Clair. I do not know if this Mr. McGregor or his estate had any connection to the funding of magnificent McGregor Memorial Conference Center that Minoru Yamasaki designed for Wayne’s campus or to the McGregor family of philanthropists who contributed resources for building the remarkably attractive McGregor Library in Highland Park. At one point in the 1990s after Mayor Archer facilitated the arrival of casino gambling in Detroit, plans were made to build three large casinos along the riverfront near the McGregor Carriage House. Those plans were changed and it now appears that the riverfront land stretching from the Renaissance Center to the Belle Isle Bridge will be used for residential purposes—some old warehouses and factories converted into condominiums, while new buildings will be constructed close to the water. This suggests that the McGregor Carriage House may survive as a night club or restaurant.